The Daily Show, Colbert Report, Plan Washington Rallies? When it comes to the behavior of television hosts Jon Stewart and Stephen Colbert, you can never quite tell when they’re being serious and when they’re just being funny. After all, their shows are a combination of satire and actual news reporting, so the blend is sometimes a little tough to make sense of. 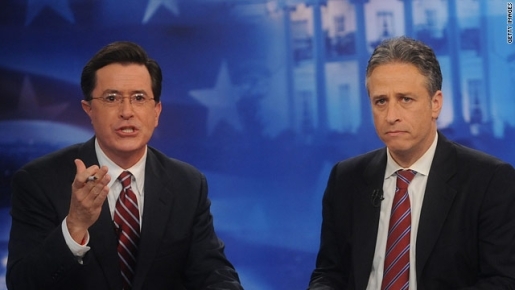 However, apparently, Jon Stewart and Stephen Colbert’s upcoming October 30 political rallies are legitimate. The two plan to hold an event on the National Mall in Washington, D.C., the same place where Martin Luther King delivered his famous “I Have A Dream” speech and where Glenn Beck held his “Restoring Honor” rally. In true Daily Show/Colbert Report fashion, Jon Stewart is planning the “Rally to Restore Sanity” while the more satirical, bear-fearing Colbert is planning the “March to Keep Fear Alive.” Both late-night talk-show hosts are adamant that the event is real, with Stewart claiming that checks have been written and the National Mall has been reserved for the event.